The Strategic Review 2017 found that although at a global level, the Global Fund has embraced the concept of differentiated approaches across the grant lifecycle (e.g. applications process, grant implementation), it was not clear whether this extends to programs at country level. In addition, the review identified a number of critical issues that need to be addressed, including country absorptive capacity and how best to ensure that programs are sustained after the Global Fund withdraws support. The strategic review was initially carried out by the consultant firm Itad in association with the Euro Health Group. The consultants were guided by continuous dialogue and feedback from the TERG. The methodology for the review included a document review, key informant interviews and country case studies. The consultants were engaged in December 2016 and their report was submitted in July 2017. The TERG presented the findings of the Strategic Review 2017 to the Board in November 2017. However, the final report on the review was not published until February 2019. The final report consists of: an executive summary (two pages); the report submitted by the consultants in July 2017 (67 pages); a discussion section with recommendations, prepared by the TERG (eight pages); and a “management response” from the Global Fund Secretariat prepared in December 2018 (two pages). In the balance of this article, we present a summary of the final report. Alignment between the 2017–2022 Strategy and an evolving global health context. There is some overlap among the topic areas. In Tables 1, 2 and 3 below, we present the findings of the Strategic Review 2017 on three specific issues included in the seven topic areas –– (1) differentiated approaches; (2) country ownership; and (3) strengthening RSSH. In addition to showing the review findings, the tables provide the relevant recommendations and responses from the Secretariat. Review findings The Global Fund has demonstrated a significant commitment to introducing differentiated approaches across the grant lifecycle. Although active efforts have been taken to reorganize the Fund’s core grant and management structures to deal with the implications of the differentiated approach, there is insufficient evidence that these changes have been or will be translated into modified behavior and results at country level. Secretariat response There is a need to continue to differentiate across the portfolio in terms of staffing, knowledge and processes; this is an area of ongoing work. Review findings The Global Fund needs to be clearer about degrees of authority and responsibility between itself and its country partners. The Fund needs to determine the extent to which the Global Fund Strategy complements national priorities. Although the Fund has made statements on what it considers country ownership to be, there are issues and tensions in implementing the principles into practice. The tensions include differences between country and donor requirements; and layers of ownership within countries (e.g. national government vs. ruling party vs. civil society ownership). Secretariat response The TERG has been assessing country ownership through desk reviews, prospective country evaluations and a thematic review on partnership models. Country ownership is strengthened in the Global Fund’s programming by ongoing efforts such as the CCM evolution initiative. The Secretariat currently provides detailed operational guidance in many areas, which outlines the Fund’s principles with respect to country ownership, and defines the roles and responsibilities of the different stakeholders involved in Fund grants. There is flexibility in how the principles and guidance are operationalized at country-level. This flexibility is needed to effectively operate in over 100 countries with highly varied contexts. Review findings Although the Global Fund has accorded a high priority to RSSH (as well as human rights and gender) issues, there is a need for greater clarity at the country level on how to operationalize these priorities through programming decisions; and there is a specific need for the Global Fund and partners to further promote attention and engagement by country stakeholders and decision makers around these issues. 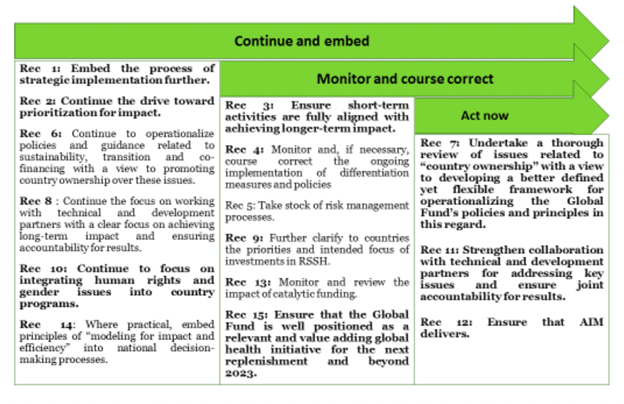 Secretariat response The Secretariat agrees that greater clarity is required in some areas, and thanks the Technical Review Panel and the TERG for providing their joint observations and recommendations, which have resulted in seven key actions to improve the Global Fund investment in RSSH. We look forward to more detailed advice and recommendations from the TERG’s ongoing thematic review and the Office of the Inspector General’s advisory work on RSSH. Note: The seven key actions identified by the TRP and the TERG fed into a discussion by the Strategy Committee on strengthening RSSH. The TERG’s thematic review has just been completed. The Secretariat told Aidspan that a report on the thematic review will be published in due course. The OIG’s advisory review is expected to be completed shortly. Reports on OIG advisory reviews are normally not made public. In addition, the Strategic Review 2017 concluded that although the Global Fund has developed definitions, policies and guidance concerning sustainability and transition, and has begun to operationalize them, there are a number of critical issues that need to be addressed. The critical issues include the following: (a) how best to ensure the sustainability of key programs after the Global Fund has exited the country (particularly those programs that engage civil society and key populations); (b) addressing complex issues related to country absorptive capacity; (c) ensuring country ownership over the transition process; (d) addressing a lack of clarity on the extent to which principles of country ownership apply; (e) a lack of engagement to discuss issues where country and Global Fund objectives do not meet and align; and (f) the need to better leverage partnerships that support the achievement of tangible results and long-term impact. The TERG presented 15 recommendations in all, divided into three categories: 'Continue and embed'; 'Monitor and course correct'; and 'Act now' (see Figure). Note: The recommendations shown in bold are ones to which the TERG accords a higher priority.